If your bathroom doesn’t promote pure, unadulterated bliss, it might be time to rethink your space. While we tend to think of the bathroom as a pit stop between point A (our bedroom) and point B (the door), leaving your personal sanctuary void of any sense of style is a sorely missed opportunity. Lucky for you, we’re privy to a constant flood of inspiring imagery and are always on the lookout for exciting ways to upgrade said decoratively versatile room. Whether you need help conquering small space woes or picking a trending paint color, we have you covered. From the best small bathroom ideas and floor tiles to shower ideas and vanities, here are the bathroom designs that will get you one step closer to your dream retreat. One of our favorite bathroom decor ideas? Add art! Art can instantly re-energize a dreary bathroom—especially if you’re not up for a taxing bath remodel. Start with a single piece (like the retro Elvis picture in this tiny NYC bathroom) and build a decorative moment around that by introducing plants, floating shelves, and your best-looking vessels to the scene. While we get that it’s nice to have all your bathtime essentials out and ready for action, if you have the storage flexibility, stick to your prettiest bottles. A tiny bathroom can serve up big problems. When you’re hard-pressed to find room for your most basic essentials (like, spare towels, cotton balls, and extra toilet paper), a rockstar shelving unit can solve all your small bathroom decorating woes. In this breezy and bright Brooklyn bathroom, a touch of eucalyptus, a copper-lined tray, and a charming print elevate the simple wood shelving system. Have an all-encompassing bathroom renovation in mind? Sybil Domond and Dan Lessin, the duo behind People of 2morrow, largely sourced the materials for their eclectic bathroom from adventures abroad. It doesn’t have to be as costly as importing 100-year tiles from the south of France. In fact, it can be as simple as swapping your sink for an antique or exchanging a builder-grade mirror for a small, vintage replacement. A well-traveled look is always a winner in our book. When it comes to bathroom colors, our spectrum rarely strays from the traditional neutrals and a handful of happier hues (pink, blue, yellow, etc.). Comprised of varying tones of chocolatey terracottas and warm caramels, this tiled brown bathroom serves as an effortless reminder that alternative color schemes can really pay off. In this particular case, both the tile work and casually scattered knick-knacks foster a slightly nostalgic ambiance. The easiest way to spruce up a cookie-cutter bathroom? Bring in older accent pieces with character—like a vintage wood stool, intricately carved mirror, or perforated basket. Aged materials and items with wear help make longtime casting director Amhalise Morgan’s bathroom feel not so new. Our favorite walk-in showers currently have one thing in common: stand-alone tubs. Put a fresh spin on this traditional bathroom marriage by making room for a sleek, sink-worthy tub. The best part about this double-duty arrangement? You don’t have to choose between a long and luxurious soak or a speedy shower in advance. Conveniently located right off the kitchen, we’ve never seen a shower so close to the stove. If you’re super tight on square footage and don’t have a pressing need for privacy, get creative with your studio layout by delineating your cooking space from the bathroom with a simple step up, like in this tranquil yogi’s apartment. Tip: A fun shower curtain will make this odd arrangement seem purposeful. While large-scale tiles and streamlined marble slabs have their definite pros, so too do smaller, arrangements. Covering every surface, the white, floor-to-ceiling tiles in this stunning Brooklyn bathroom create an intriguing glistening effect while also amplifying the sense of texture and natural light in the bathroom. Finished in Carrara marble and peppered with rustic touches, this Scandinavian-inspired Minnesota farmhouse exudes shabby-chic. To add that special splash of Midwestern flair, the home’s owner and designer, Kassina Folstad, brought in elements like antlers, street pavers, and remnants from a rotted fence posts, to complete the rural-modern concept. Ladders are one of our favorite ways to hack a minuscule space—especially when it comes to small bathrooms. In lieu of a traditional towel rack, restaurateur Matt Kliegman and his now-wife Sophie Green maximized their opportunities for hanging towels and scrap clothes by giving an old painter’s ladder new life as a catch-all surface. You can never go wrong with the classics. When coupled with curvy furnishings and abstract artwork, there’s something especially mod about an (almost) exclusively black and white bathroom. The hammered metal vessel sink in this unexpected Brooklyn home takes the artful space over the edge. As if directly inspired by a 5-star spa, this pedestal sink perfectly channels the peacefulness of a bathroom only found at a remote, luxury resort. The slight curve of its composition and natural stone surface make it a rejuvenating spot to wash up and recharge come morning. Two-tone bathrooms are having a moment. Breaking up the busyness of the wild wallpaper above, a streamlined sea of coordinating colored bathroom wall tiles below act as a harmonious counterpart. Paired down with cool brass hardware, this high-impact moment merges pattern and texture in one flawless nook. Pink bathrooms have left us completely smitten—most notably, this incredibly playful pairing of a loud floral wallpaper and retro square tiles. While color is certainly the primary game changer in this New York restaurant, the magic really exists in the details. A hot pink rotary phone and pineapple print kick the fun into high gear. Looking for alternative shower tile ideas? Impressive geometric tiles bring fresh dimension and interest to LA-based singer and entrepreneur Lourdes Hernandez’s monochromatic bathroom. Making a solid case for going beyond the bounds of a standard subway tile or simple marble floor, new shapes give this pink shower life. No matter how large or small your bathroom, you don’t have to restrict yourself to hanging air plants and tiny potted greens. Forgo your standard slew of petite shrubs for towering leaves. Before you know it, your modern bathroom will double as a tropical oasis. Timeless pattern and cool metals collide in this revamped 1960s master bathroom. Taking a minimal industrial approach, this clean, mod space makes a statement with subtle features, such as the herringbone tile work, silver knobs and pulls, and grainy wood cabinetry. Decorating with yellow is never an easy feat, but when done correctly the sunny hue can convey a show-stopping effect. In this summer beach home, an energizing lemon and oyster wallpaper print introduces a bonus dose of character to the otherwise all-white bathroom. Much like the walls, the bathroom floor is a canvas for creativity. In the same aforementioned beach home, a breezy blue and white pattern takes the ground by storm; it’s heavy-handed linear design putting a spin on the quintessentially nautical color pairing. Clean, white, and blissfully unaware of unnecessary clutter or color, we can’t decide what we love more about this streamlined bathroom: The cheery lineup of woven storage baskets below the vanity or the room’s naturally calming aura. A white marble bathroom is the design equivalent to a breath of fresh air. While the deep, dramatic blue that earmarks the area around the sink extends a sense of darkness to this Cali-cool bathroom, the temple wallpaper print and embroidered palm tree towels reiterate a friendly coastal feel. The space feels breezy and beachy, without falling into a trap of tropical cliches. A jet black vanity is sure to draw attention. Standing in rich juxtaposition with its white and brass surroundings, this unique piece makes a case for a traditional his and hers with striking metallic hardware. Revealing only the essentials, this exposed rainfall shower is as heavenly to look at as it would be to stand under. The addition of a tiny wooden stool brings new meaning to the industrial space. Between the exposed brick wall, vintage wood vanity, exposed bulb lighting fixtures, and antique rug, this rustic farmhouse bathroom is swimming with juxtaposing textures. If your bathroom already happens to come with textured walls, play up its tactile nature by introducing other touchable materials and surfaces into the room. Mirror, mirror on the wall, who’s the cleanest of them all? Have some fun with your reflection by hanging a mirror in the shower. Sure it might fog up once the hot water is running, but on the off chance you don’t have a proper vanity and mirror for primping, this is one clever way to pull double duty. Powder your nose in style by going all in with brass accents. 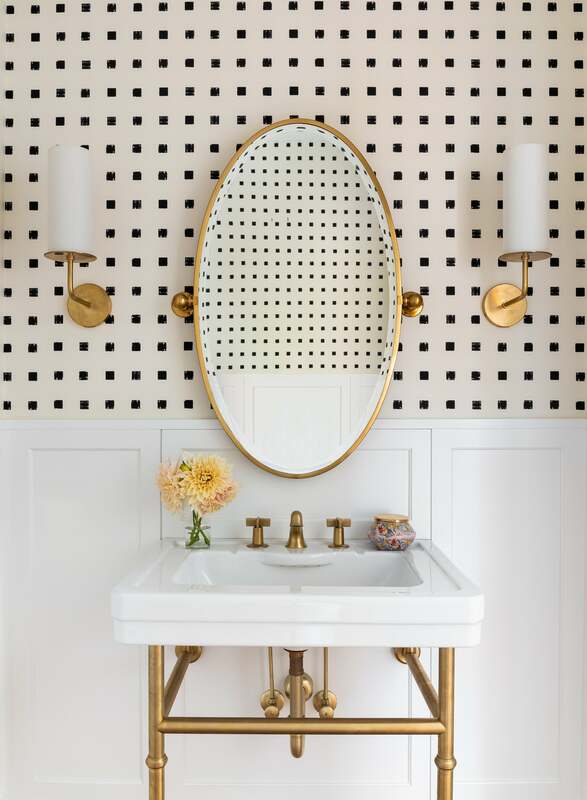 We do admit that the striking wallpaper may be the first thing that catches your eye here, but the exposed brass pipings paired with the sconces and mirror win the blue ribbon. If done right, mixing metals has the power to add some serious dimension to your bathroom. As with any risky design trend, it’s much easier said than done. To nail this look, keep the colors neutral so the metallics steal the show. Sure, you could ease into a dark and moody powder room by doing just dark wallpaper or only dim lighting, but we say take the plunge and go for the trifecta. Slap on some brooding wallpaper, swap out your lightbulbs for ones that have a metallic tip, and opt for a smaller mirror granting less light reflection to really take things a step further. This story was originally published in November 2018, it has been updated with new information.